Life really would be a beach for any player who manages to snare the progressive jackpot attached to the five reel, three row and 20 payline slot that is Beach Life. 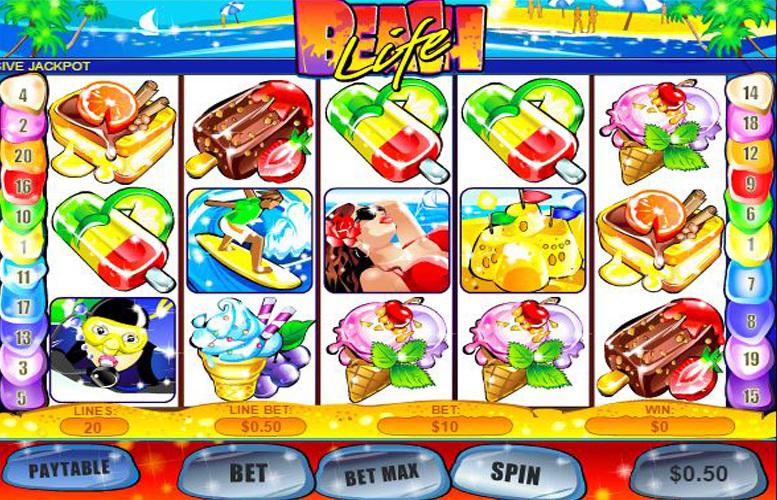 Set on an idyllic beach, the game’s reels are populated with sandcastles, ice lollies and other seaside staples, whilst the game itself includes wild symbols, scatter wins and a bonus game alongside the linkage to a generous progressive jackpot. The progressive jackpot linked to Beach Life could see players walk away with a payout well into the millions of pounds. Beach Life’s bright and cheerful theme can’t help but make players smile. Scatter wins, wild symbols and a bonus round introduce even more additional ways to win through the Beach Life slot. With a set line bet amount of 50p, players can only change their stake amount per spin by altering the number of active paylines. Beach Life’s top payline jackpot – behind the progressive jackpot – is worth a maximum of £50,000, which is generous but still lower than those offered by many other slots. The progressive jackpot can only be won by players who are betting at the maximum level. 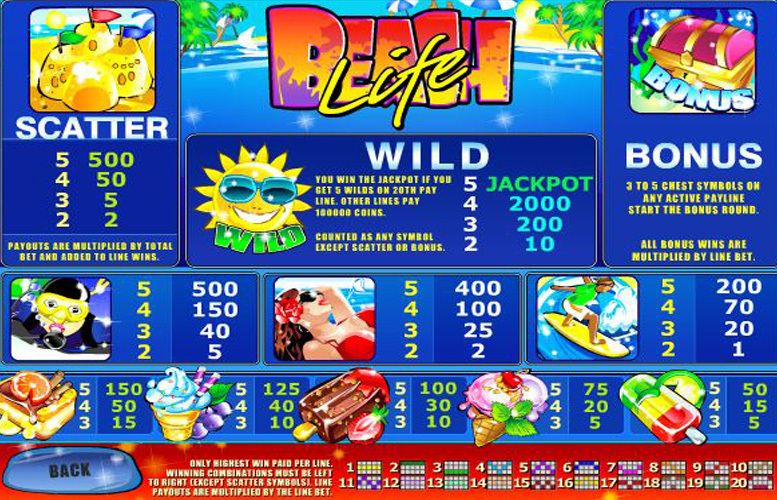 The highest jackpot that a player could win through playing Beach Life is obviously the progressive jackpot to which the slot is linked. We will discuss that later, however, so first let’s talk about the game’s highest available payline jackpot. That jackpot results when a combination of five of the slot’s sun wild symbols line up along an active payline (other than the 20th payline). If that particular combination does appear, the player’s jackpot will be worth 100,000 times the line bet. As that line bet is always set at 50p, the jackpot is therefore worth £50,000. Beach Life isn’t all about bright colours and cheerful images, it is also a slot with a number of interesting additional features to introduce extra interest and winning potential. Those features are namely the game’s wild symbols, scatters, bonus game and its linkage to a progressive jackpot. Showing a shining sun with a pair of sunglasses on, the Beach Life wild substitutes for all other symbols apart from the bonus and scatter symbols, in order to make up the most valuable possible payline combinations. If anywhere between two and five of the Beach Life scatter symbols, which depict an image of a sandcastle, appear on the reels at the same time the lucky player receives an instant win. The size of the win depends upon how many of the scatters appear. Beach Life’s Treasure Chest Bonus Game is triggered by the appearance of three to five treasure chest bonus symbols along any active payline. A player can then choose anywhere between three and five chests (depending upon how many symbols triggered the game) from those presented to them. Each chest contains a different sized prize, and the player’s bonus winnings equal the sum total of those prizes. Whilst five of the slot’s wild symbols appearing along any payline from one to 19 results in a £50,000 payout, the same combination appearing on payline 20 triggers a progressive jackpot. The 20th payline must be active for the jackpot to be won and the size of the jackpot depends upon how recently it was last won. The symbols on the Beach Life reels not already mentioned above all depict items and images related to a good old fashioned beach holiday. They include various different ice cream treats and a trio of people you might meet by the seaside. It is those character symbols which are most valuable behind the game’s wilds and the most valuable of all is the scuba diver symbol. If five of those symbols line up along an active payline, it results in a jackpot worth 500 times the line bet (£250). Whilst Beach Life excels in many areas one notable downside with the slot is the comparatively limited options players have when it comes to how much they wish to stake per spin. The line bet amount of 50p is unchanging, after all, meaning that players can only alter the number of active paylines. The game has a maximum 20 paylines that can be active at any one time and anywhere from that maximum right down to just one can be activated by a player for each spin. As players have no choice but to bet 50p per line that means that the overall minimum bet is 50p and the maximum is just £10. Offering players the chance to visit an idyllic beach from the comfort of their own home and potentially to win the money required to go there for real, Beach Life is a fun and cheerful five reel slot. Players who enjoy simple and straightforward slot games will like the fact that Beach Life gameplay takes very little time or effort to understand, whilst those who dislike repetitive slots will like the fact that the game includes a bonus round. All players, too, are likely to be fans of the progressive jackpot linked to Beach Life which can offer payouts of truly life-changing amounts of money. Payline jackpots aside from the progressive jackpot, however, are on the stingy side across the board when compared with those offered by many other slots. Stake options are relatively limited for Beach Life players, too, but scatter symbols and wilds do at least improve those players’ winning potential. This game has a rating of 4 / 5 with 563 total reviews by the users.